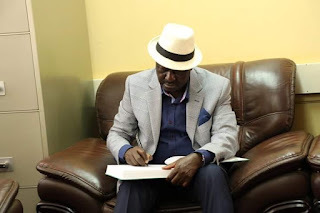 Saturday August 18, 2018 - NASA leader, Raila Odinga, has revealed that he is ready and willing to extend the handshake and close ranks with his political nemesis, Deputy President William Ruto. Speaking at Kapsogeruk Village in Bureti Constituency during the burial service of the late Eng. Joseph Chepkowny, Raila said his journey to unite Kenyans and all leaders will leave no one out, including Ruto. The NASA leader extended the hand of friendship to Ruto and invited him to come and help him and President Uhuru Kenyatta unite the country through the Building Bridges Initiative. “There is no one who we will leave out in the handshake move,” said Raila.